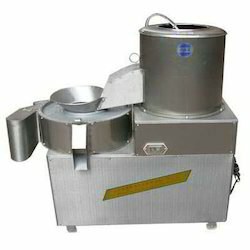 Prominent & Leading Manufacturer from Ahmedabad, we offer potato peeler machine. We have been counted as major firm offering high performing Potato Peeler Machine. Designed thoughtfully to lower the operating cost the energy efficient potato peeling machine is best suited for restaurants and industrial kitchens. Developed from premium grade material under strict quality supervision the offered machine is one of the best selling potato stripping equipments available in the industry. Further, we are procuring industry compliant components to manufacture the high performing machine which can be ordered from us at a nominal price.